1 The Vietnam War was a conflict that began in the 1950's. It continued until 1975. Vietnam veterans came home to a very different America than those returning from the Gulf and Iraq wars. Vietnam veterans were not welcomed home. The Vietnam War is the only war the United States of America has ever lost. 2 Almost 11,000 military women were stationed in Vietnam during the conflict. Most of them were nurses. There were 265,000 women who volunteered to serve throughout the war in Vietnam. They risked their lives to care for our country's wounded and dying. 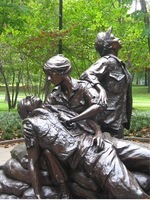 The Vietnam Women's Memorial was created to honor those who served in the war. It also honors those who may have lost a loved one who was cared for by a woman serving as a nurse during the conflict. 3 The first part of the mission statement for this memorial is as follows: "The mission of the Vietnam Women's Memorial Project is to promote the healing of Vietnam women veterans through the placement of the Vietnam Women's Memorial on the grounds of the Vietnam Veterans Memorial in Washington, D.C." Its purpose was also to honor both military and civilian women who served in Vietnam.